The AMSAT-UK FUNcube-1 satellite is due to launch on a DNEPR rocket from Yasny later this year. This launch could carry around 11 amateur radio satellites including FUNcube-1 into space. As a result the International Amateur Radio Union (IARU) satellite advisory panel have had to carefully coordinate the planned operating frequencies in order to minimise the risk of interference between FUNcube-1 and other payloads on the same launch. AMSAT-UK have announced that the power of the FUNcube-1 1200 bps BPSK telemetry beacon has been increased to 400 milliwatts. This should provide a strong signal for school students to receive using simple equipment. 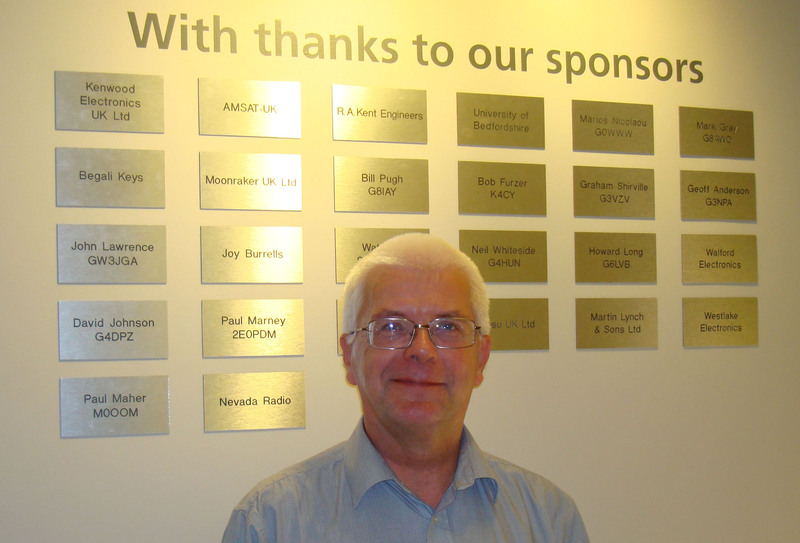 Sponsor plaques have now been fitted in the reception to the RSGB National Radio Centre at Bletchley Park. Dave Johnson G4DPZ is one of a number of individuals and organisations who either gave freely of their time or supplied equipment to make the National Radio Centre the premier exhibition that it is. AMSAT-UK donated the WiMo X quads for 144 and 430 MHz along with pre amps and polarisation switches for the amateur radio satellite station. They are connected to a Kenwood TS-2000 loaned by Kenwood Electronics. The Jan 25-31 printed edition of Electronics Weekly (circulation 36,400) carries an article on the AMSAT-UK FUNcube amateur radio satellite. The article, titled “Schools’ communications satellite to put the fun back into science lessons”, appears on page 12. (The PDF can be downloaded by clicking on the PDF icon at the top). A free subscription to the digital version of the publication is available via the Electronics Weekly website http://www.electronicsweekly.com/ On the lef-hand side under “SIGN UP TO” click on “Digital Magazine”. Journalist David Meyer interviewed AMSAT-UK’s Jim Heck G3WGM for an article on the FUNcube-1 satellite being built by AMSAT-UK volunteers. School students will be able to send, via a moderator, ‘Fitter’ (as in ‘FUNcube Twitter’) messages of 200 characters to the CubeSat. FUNcube-1 will then transmit them on the 1200 bps BPSK beacon. The satellite will carry a 500 milliwatt 435 to 145 MHz linear transponder for SSB and CW communications. An agreement has now been reached with ISIS Launch Services BV, who are based in Delft in the Netherlands, for them to provide a launch of the FUNcube-1 CubeSat. It is anticipated that FUNcube-1, which has been created by a team of volunteer radio amateurs and other specialists over the past two years, will be launched with a number of other spacecraft from a DNEPR rocket sometime in the third quarter of 2012. The flight is planned to take place from the Yasny launch facility which is in southern Russia near to the Kazakhstan border. The spacecraft needs to be completed by the end of July 2012, ready for shipping from the Netherlands to Russia. The orbit is still to be defined precisely but it is expected to be nearly circular and approximately sun synchronous. This will ensure that the spacecraft has the necessary solar illumination and that it will appear at regular times for educational outreach activities at schools and colleges. The FUNcube-1 spacecraft will transmit signals that can be easily received directly by schools and colleges for educational outreach purposes. This telemetry will give details of the spacecraft’s health – battery voltages and temperatures and from this it will be possible to determine its spin rate and attitude by plotting simple graphs. Additionally, experimental data and messages can be displayed in an attractive format and provide stimulation and encouragement for students to become interested in Science, Technology, Engineering and Mathematics (STEM) subjects in a unique way. The target audience for this project is students at both primary and secondary levels and a simple and cheap “ground station” – actually it looks just like a USB dongle, for schools to use, has already been developed. All donations of £25 (or equivalent) or more will be specially acknowledged by the spacecraft itself – exact details will follow shortly! All donations received from UK tax payers can be “Gift Aided” which will add 20% to the value of your donation.